On a recent visit to Edmonton, we took a detour to the small town of Wetaskiwin where I was able to fulfil my long desire to see the Reynolds Alberta museum. The huge pieces of steam equipment lining the drive into the museum were almost worth the visit. But on entering the modern museum building, I was fascinated to see a huge horizontal engine spotlighted in the glassed in entrance. Polished like new, its steel parts glistening, the huge flywheel turned over slowly as an electric motor cycled the engines piston and elaborate valve gear. The surprise, on studying the placard inside the building more closely, was to find that the engine was made in London, Ontario by the E. Leonard & Sons Company. 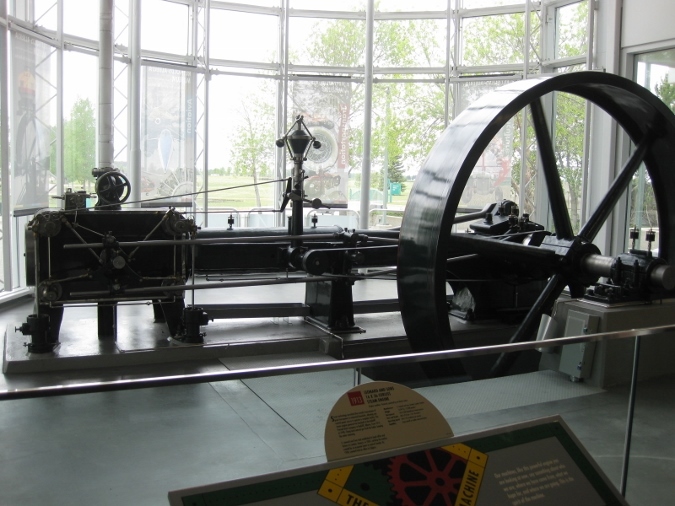 The surprise part was that I was unaware that the company had made steam engines of this size, equalling those made in Galt by the Goldie McCulloch Company. It was a great entrance installation, and was matched by the exhibits of machinery and equipment inside. Read the history of the Leonard Company in my book “Steam Engines and Threshers”.